Going from large- to small-scale modeling improves understanding of aerosols’ effects on climate change. Scientists focused on the sub-grid level to quantify the small feature variability of major chemically active trace gases and aerosols. Results: The devil is in the details, the very small details, when it comes to global climate models, and those details are now easier to see, thanks to climate change researchers from Pacific Northwest National Laboratory. The team is estimating the impact of small-scale features within a large-scale system for aerosols to bring insights to climate change modeling. Like a wide-angle camera lens, current large-scale climate models miss the fine details in any particular climate picture. Using the macro lens of the modeling toolkit, these scientists were able to show the details, better representing aerosol data for climate modeling. Why it matters: Advancing our knowledge of atmospheric processes that affect climate will help us plan energy use for an environmentally sustainable future and mitigate the health effects. Currently, large-scale models miss the fine details of features such as aerosols that may be disbursed from a point source across a wide area, or influenced by terrain. These details are what researchers call the sub-grid variability (SGV) in climate and atmosphere activity modeling. Quantifying the small feature variability in a particular climate system can ultimately help researchers better understand the effect of aerosols on climate. 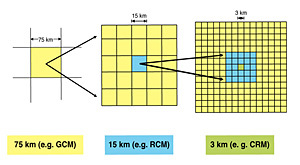 Methods: Current large-scale, grid-based climate modeling is limited by its inability to show details smaller than the selected model grid size. Accounting for the variability of aerosols and trace gases due to terrain and local emissions is an important detail in understanding the transport and mixing of these particles in the atmosphere, and their effect on global climate change. The concept is called parameterization. Using sampled data from the 2006 MILAGRO field campaign in central Mexico, scientists at PNNL refocused their investigation from a typical global climate grid of 75x75 km2, to a 3x3 km2 grid. They concluded that this fine detail could enable them to pick up the SGV of the trace gases and aerosols typically studied in the larger global climate grid. Using WRF-Chem, a version of the Weather Research and Forecasting (WRF) model that simultaneously simulates the emission, turbulent mixing, transport, transformation, and fate of trace gases and aerosols, they simulated multiple scenarios and spatial resolutions to compare to observed data. They calculated the probability density functions (PDFs) within a grid cell for major chemically active trace gases and aerosols, such as black carbon, sulfate, and nitrate. These results show a better spatial variability of pollutant emissions at higher resolutions (the 3x3 km2 grid) and that this spatial variability contributes a large share of the SGV of aerosols. This research shows, for the first time, the PDFs of major chemically active trace gases and aerosols that will benefit development of aerosol parameterization in global climate models and understanding the impact of aerosols on climate. What's next: Researchers will continue to improve their understanding of the SGV and aerosol parameterization in climate modeling. They will focus on more species of aerosols over additional global regions to help them understand the total picture of aerosols in climate modeling. Acknowledgments: This research was supported by the Department of Energy's Office of Biological and Environmental Research, Climate and Environmental Sciences Division through its Atmospheric Systems Research Program, and was performed by Yun Qian, William I. Gustafson Jr., and Jerome D. Fast of the Pacific Northwest National Laboratory. Dr. Gustafson was also supported by a Department of Energy Early Career Award. Reference: Qian Y, WI Gustafson Jr, and JD Fast. 2010. "An Investigation of the Sub-Grid Variability of Trace Gases and Aerosols for Global Climate Modeling." Atmospheric Chemistry and Physics 1: 6917-6946. doi:10.5194/acp-10-6917-2010. http://www.atmos-chem-phys.net/10/6917/2010/acp-10-6917-2010.html. Aerosols are microscopic particles dispersed in the atmosphere that affect climate change. Yet, compared to cloud research and modeling, aerosols and their influence on climate change are not as well understood. Measuring and modeling aerosols remains a large challenge for climate scientists.